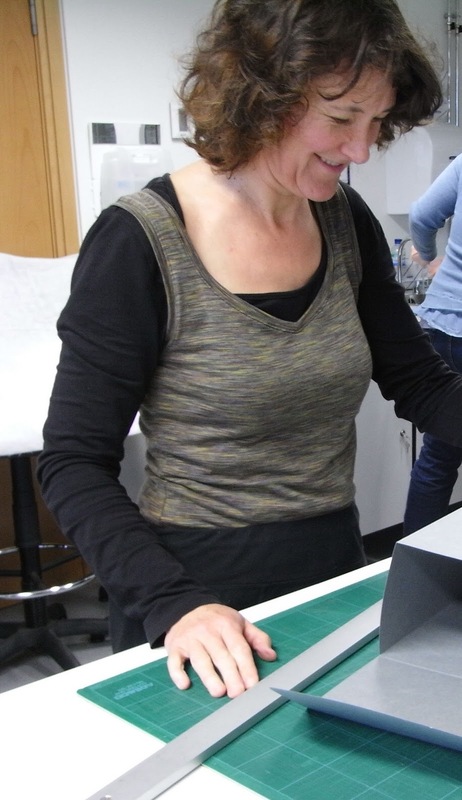 On Tuesday we were delighted to welcome another new volunteer to the conservation studio, Fiona. 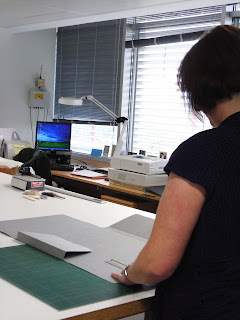 Both Fiona and our other conservation volunteer, Sandi (who joined us a couple of weeks ago), will be blogging regularly to let you know what they’ve been working on. So, over to Fiona…. I’m nearing the end of my first day as a volunteer here and feel a huge sense of satisfaction at what I’ve achieved! This morning I have to admit I was feeling a little nervous, but I needn’t have worried at all! I was started off gently with a tour of the department and introductions to some of the (very friendly) people I’ll become familiar with while I’m here. I then settled down with a folder of information I need to know about handling the wonderful variety of documents and objects I may come across. I think the folder and I will become close friends - Ruth, Sandi and I are going to pad it out with our notes on treatments and a record of what we’ve been doing. Next, Ruth showed me how to make a four-flap document folder to re-house loose sheets in. After making some notes and asking lots of questions, I had a very slow and careful try at making one to hold some fairly large sheets which had just been flattened after being stored rolled up for a long time. It worked! The sheets fitted nicely inside and it looked neat! I tried a second and as this time I felt a bit more confident, Ruth gave me slightly more complicated contents - some sheets that had been folded, making the pile very up-and-down in depth. With a little trimming to get a perfect fit, my second folder worked well too! I am very pleased and really enjoyed the crafting and problem-solving involved in folder making. It is nice to know the documents I packed up today will be there for someone to refer to in years to come. I can’t wait to come back and do some more! This week LHSA has received an accession of patient index cards: more than 100 drawers’ worth! These were originally from the Royal Infirmary of Edinburgh Dermatology Department, but kept more recently at the Western General Hospital where NHS Lothian’s dermatology services are now based. The index cards date from approximately 1904-1967 and record the patient’s details with a brief synopsis of diagnosis and treatment. They often contain other information such as charts and correspondence. Included in the accession were also a small number of case notes and registration cards. The drawers as they arrived were completely disordered, dirty and did not provide adequate protection for the contents, so a decision was made to re-house the cards immediately. 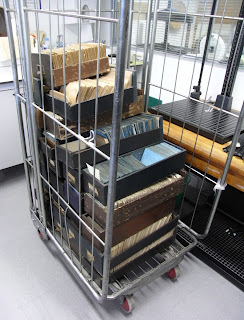 Firstly, the drawers had to be ordered chronologically, decade by decade. It was found that there was a main year by year patient sequence plus a number of other sequences relating to x-rays and to particular practitioners, therefore it was decided to create one chronological sequence first, followed by these additional sequences and any drawers that had no identification. The index cards were surface cleaned with a soft brush and checked for the presence of pests then placed in archival boxes in order. 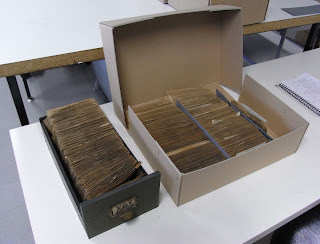 Each archival box can house the contents of more than one original drawer so a note was kept of which drawers’ contents had been placed in each box and a slip of archival paper was placed at the start of each run of index cards in the box with the original drawer’s title. Not all the index cards were of the same size therefore they were orientated accordingly to fit and two different box sizes were used. The archival boxes were numbered in pencil as they were filled and then the box content notes were typed onto a labelling sheet and neat labels were printed and attached to the boxes. Now that the index cards have been re-housed they take up less space, they are more accessible and are protected from further damage. The next step will be cataloguing them to make their research potential widely known. “I’ll be volunteering one day a fortnight here for the foreseeable future. My first task was to read the Conservation guidelines, Health & Safety issues, treatments and proper documentation concerning any projects undertaken. Ruth, the Paper Conservator, then demonstrated how to make a 4 flap folder from archival card. It took me a long time to gain the correct spatial awareness for this task. Perhaps Ruth will keep my first effort to show future volunteers ‘how not to do it’! (Assistant Archivist’s note: if it’s any consolation Sandi, I struggle to cut card with a scalpel!). LHSA has several new volunteers starting in the next month and we hope they all enjoy their first day as much as Sandi. If you’re interested in volunteering with us and learning valuable archival and conservation skills, please fill in one of our volunteer forms, available at the foot of our Services and Access web page. Today Laura and Ruth have been identifying items in the LHSA collection for potential future display in Edinburgh University’s ‘Masterpieces’ exhibition series. The current programme for the Main Library’s Exhibition Room includes three exhibitions held over a number of years that showcase iconic items in the University Collections. 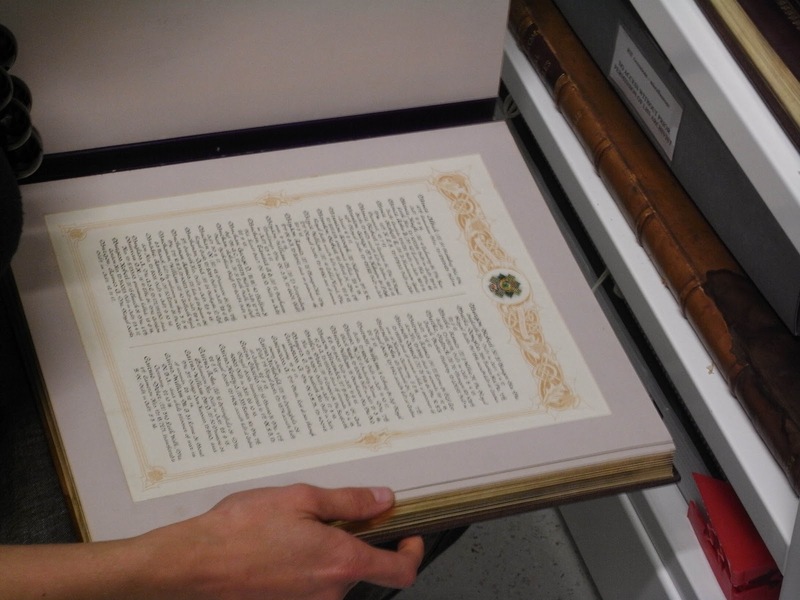 The first exhibition, ‘Masterpieces I’, ran from December 2009 to March 2010, in which LHSA’s 1736 Charter for the Royal Infirmary of Edinburgh was displayed. The next exhibition is planned for March 2012, and the shortlist of items going on display will be decided next week. Large exhibitions like ‘Masterpieces II’ need a lot of preparation prior to installation, and object selection is the first stage of a long process. Contenders to go on display include letters by Florence Nightingale, first editions of texts on midwifery and the Leith Roll of Honour for the First World War. Material from LHSA’s HIV/AIDS collections have been granted automatic entry into the exhibition because of their recent addition to the UNESCO UK Memory of the World Register! For more information about the Infirmary’s Royal Charter, please see our website.